Alfie apprenticed with Hannah at her workshop on Jubilee Wharf in 2013/14. In this time he built his apprenticeship piece, a copy of Stradivari's famous instrument "Le Messie". 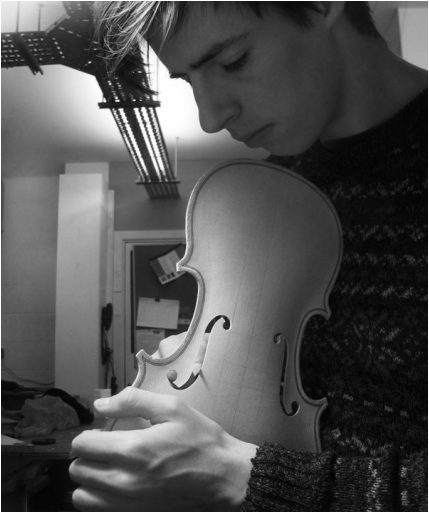 Click here to see his photo documentary of making his first violin. After that he undertook repairs professionally under Hannah and started work on two more Strad copies. Alfie is also a professional musician, with a BA Hons in Music Composition from Falmouth University. He plays with many bands in the southwest such as, 'The Klezbians', 'Jon & Alfie', 'Lichen to Giants' and 'Lasair'. In May 2016 Alfie put aside the tools and took up the bow (and plectrum) and focussed on gigging across the UK. Please visit his personal website, which has information and updates on all of his musical endeavours.